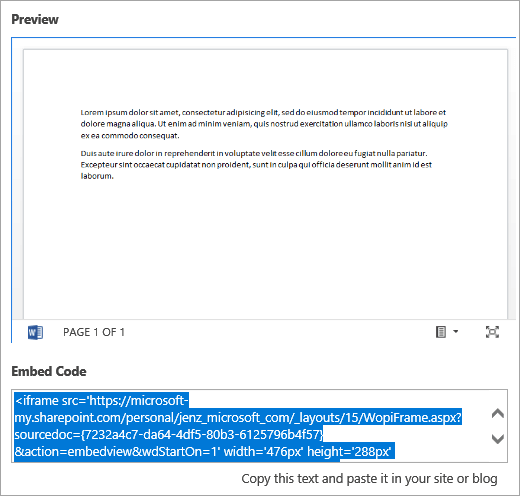 You can insert Office documents stored on OneDrive, OneDrive for Business, or SharePoint in a Sway by pasting the embed code for that document into your Sway. Sway currently supports the embedding of Word, Excel, and PowerPoint documents including individual charts/tables from Excel. Note: You will need to make sure that the permissions of your Office documents stored on OneDrive, OneDrive for Business, or SharePoint are properly set for your audience. If you're in Word Online, Excel Online, or PowerPoint Online, create or open an existing document from your OneDrive, OneDrive for Business, or SharePoint Document Library. Note: If you don't see the File menu, you're probably in View mode. Click Open > Open in Word Online, Excel Online, or PowerPoint Online to open your document in Edit mode, and then you should see the File menu. Sign into Sway and open the Sway to which you want to add your Office document. ﻿Paste the embed code that you copied in step 4. 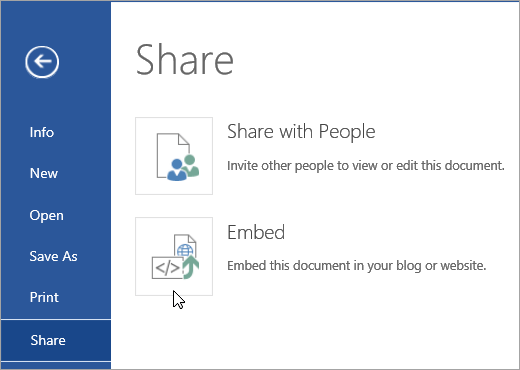 ﻿Click ﻿Preview﻿ in Sway to see how your Office document looks in place in the Sway.